Your car is really fast in right-hand turns, but understeers in left turns. If you get the car neutral in left turns, it oversteers in right turns. The situation is frustrating. 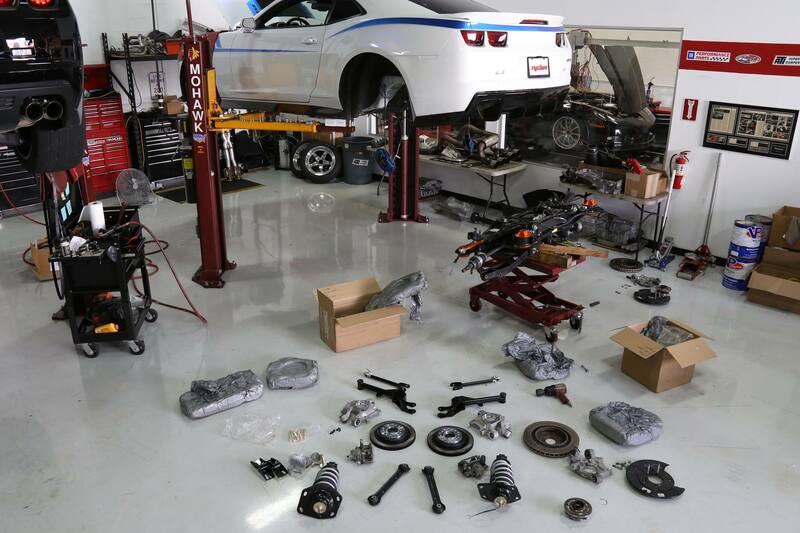 You’ve tried springs, shocks, different bars, neutralizing the anti-roll bar, and nothing seems to work. Even on a track with mostly right-hand turns, the problem in the left-hand turns cost a lot of time. While several different setup parameters could have caused this situation, a likely cause is excessive cross-weight. Static weight distribution is the weight resting on each tire contact patch with the car at rest, exactly the way it will be raced. This means the driver should be in the car, all fluids topped up, and the fuel load should be such that the car makes your minimum weight rule at the designated time-usually after a race. The car should be at minimum weight, using ballast as needed to make the proper weight. When working with static weight distribution, we use two percentages to analyze the car’s corner weights: Left weight percentage and rear weight percentage. These tell us all we need to know about the setup relative to the weight distribution. The left weight percentage is found by adding the LF weight to the LR weight and dividing the sum by the total weight. The rear weight percentage is found in a similar manner: Add the LR and the RR weight together and divide the sum by the total weight. Many electronic scales will perform the calculations for you. 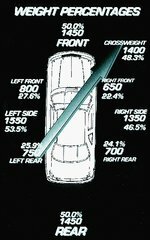 For road racing and autocrossing, the ideal left weight percentage is 50 percent. This makes the cornering force balanced from left to right and offers the best performance overall. However, many cars cannot make the 50 percent left-side weight percentage due to driver offset. Still, it is a worthwhile goal to strive for 50 percent left-side weight. Rear weight percentage for road racing and autocrossing is less definite. The more power a car has, the more that static weight over the drive wheels helps acceleration off the corners. Additionally, it is much more difficult to change rear percentage much, since rear weight is mostly a design function. 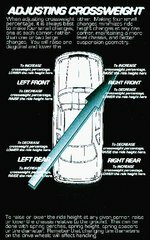 It still pays to be thoughtful about weight placement fore and aft in your car. The only way to change the static weight distribution percentages is to physically move weight around in the car. Jacking weight will not alter the left side or the rear percentages. Cross-weight percentage compares the diagonal weight totals to the car’s total weight. 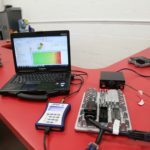 To calculate cross-weight percentage, add the RF weight to the LR weight and divide the sum by the total weight of the car. Cross-weight is also called wedge: If the percentage is over 50 percent, the car has wedge; if below 50 percent, the car has reverse wedge. More wedge means that the car will likely understeer more in a left turn. The advantage to wedge is that the left rear tire carries more load, so the car drives off the turns better. But in a right turn, the opposite occurs and the handling is worse. In almost all cases, the loss of cornering performance in one direction is greater than the gain in the other direction. On oval track cars, cross-weight is usually used in conjunction with stagger (where the right rear tire is larger in circumference than the left rear tire) to balance handling. More stagger usually loosens the handling in left turns, so more cross-weight is used to tighten it up. But stagger is not a good idea on a road course or autocross either, where the ideal is 50-percent cross-weight and no stagger. One of the problems with cross-weight is that it will change the handling balance from a left to a right turn. This can make maneuvering in traffic difficult, even dangerous. On a road course, the cross-weight percentage should be very close to 50 percent, within a half-degree either way, to keep the handling balance similar in a right-hand turn compared to a left-hand turn. In the example at the beginning of the article, this was the problem: a cross-weight percentage that was less than 50 percent, and probably off by at least two percent. One of the keys to obtaining a good setup is using the correct procedure to weigh your race car. Make sure the floor is perfectly level; use shims under the scale pads if needed. Small angles can throw off your readings significantly. Check stagger at each tire, even if using radials. Put the driver weight in the car, preferably the driver. Use a load of fuel for where you you want the car balanced, either at the start of the race, the end of the race or an average between the two. Disconnect the shocks, when possible, and the anti-roll bars. Use blocks the same height as your scale pads to move the car off the scales to make adjustments. Bounce the car at each corner to free the suspension from any bind, then roll the car onto the scales. Make sure the tires are centered on the scales. Recheck air pressure often to assure ride heights stay consistent. Check static weight before working on cross-weight. 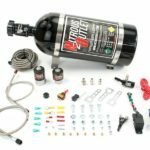 The only way to change static weight is to physically move weight or ballast in the car. To increase left-side weight, move weight as far to the left as possible. To increase rear weight, move weight as far back as possible. Move ballast first, since it’s easier. Then move components like the battery or fuel cell. It is best to get 50 percent left-side weight when possible. Get the rear percentage as close to the manufacturer’s specs as possible. Once static weight percentages are set, work on cross-weight percentages. You cannot change the left or rear percentages by jacking weight around in the car, although this will change cross-weight. Changing the ride height at any corner will change the cross-weight percentage. If you raise the ride height at a given corner (put a turn in or add a round of wedge), the weight on that corner will increase, as will the weight on the diagonally opposite corner. The other two corners will lose weight. If you lower the ride height at a given corner, that corner will lose weight as will the diagonally opposite corner. The other two corners will gain weight. This will not change the left-side or rear weight percentages. To add weight to a given corner, raise the ride height at that corner or lower the ride height at an adjacent corner. For example, if your initial setup is 52 percent cross-weight, and you want 50 percent cross-weight, lowering the right front or left rear corner will decrease cross-weight percentage. You could also raise the left front or right rear ride heights to do the same thing. It is best to make small changes at each corner, instead of a big change at one corner. This keeps the ride heights as close to ideal as possible. In the above example, to go from 52 percent to 50 percent cross-weight, try lowering the right front and the left rear one-half turn on the weight jack bolt or spring perch while raising the left front and right rear the same amount. Always record the cross-weights and ride heights for reference at the race track in case changes are needed. Measure control arm angles after each change. The angles are another way to set the suspension for the desired ride height and cross-weight percentage. The distance from the ground to an inner suspension arm pivot point will also accomplish the above goal. Remember that changes in stagger, tire pressures and springs will change the ride height and alter the cross-weight percentage. Make small changes at the track, and make only one change at a time. If the car understeers or oversteers in only one direction, check the cross-weight percentage. One of the most important aspects of racing is having a good handling balance. Setting static weight distribution and adjusting cross-weight percentage is one way to assure good handling. Taking the time and making the effort always pay dividends.